Colorado is home to many different fun activities, a lot of which revolve around enjoying the majestic mountains via hiking or skiing. 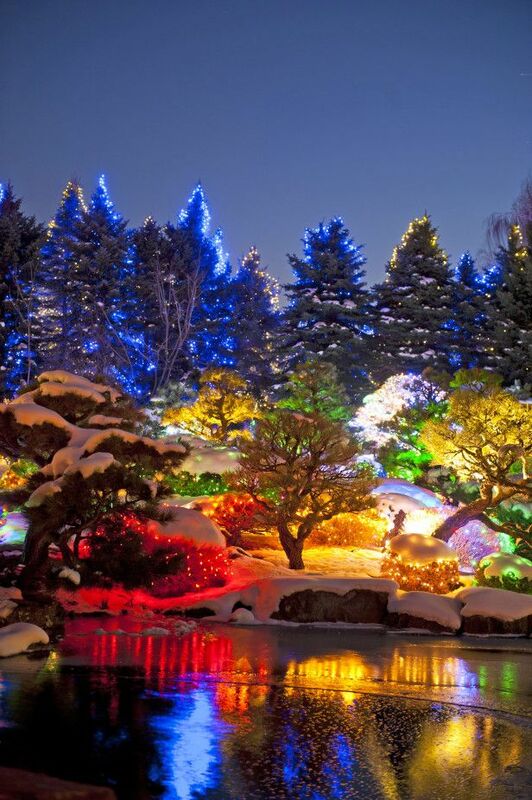 There are also a wide range of museums, gardens, and zoos to enjoy during your stay, making Colorado the perfect destination for families and individuals alike, no matter whether you prefer relaxing vacations or have a sense of adventure. Here are the top 16 must-do and must-see activities in the gorgeous Colorado State. The Snake River that flows through Keystone is a great place to do some fly-fishing and catch some trout; this pristine river is offers stunning views and peaceful areas to practice your skills. 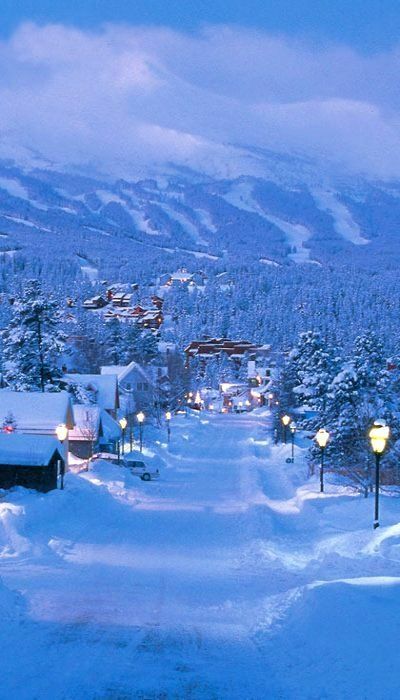 In Keystone, it is mainly catch-and-release. The nice thing about the Snake River in Keystone is that it is easily accessible, oftentimes you can walk to the river from your condo and in the late spring you can ski/board at one of the local resorts and then head on over to the river for some fishing in the afternoon. Garden of the Gods is one of the most famous attractions for technical rock climbers in Colorado. It is also a popular tourist attraction for visitors to Southern Colorado and the City of Colorado Springs. 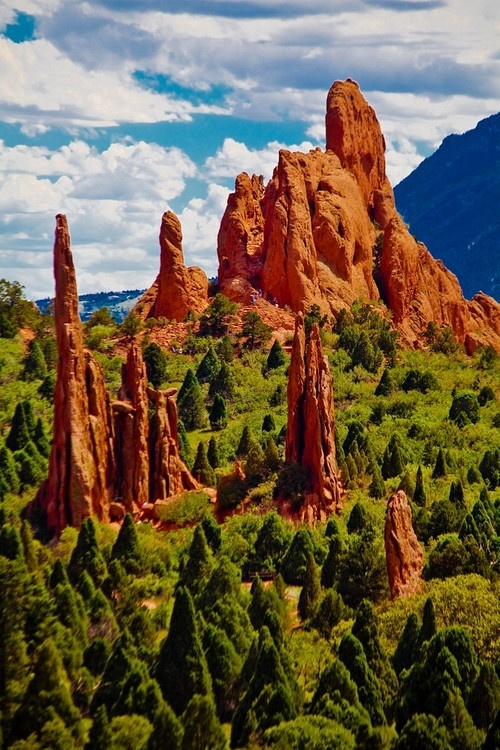 Under the shadow of Pikes Peak, Garden of the Gods is a city park filled with red sandstone spires that defy the imagination. Millions of visitors come to marvel at the formations each year, and plenty of climbers flock to the area to challenge the classic and historic routes in the park. The park is very easily accessed, and offers a playground of rock for the technical climber. Almost every route in the park is traditional. This remarkable climbing area has all sorts of climbing, from friction slabs to finger cracks, all within a few square miles. There are fantastic beginner routes, and extremely tough testpieces for experts. The Garden is truly one of the most unique and beautiful climbing areas in the U.S.
Bear Lake, a beautiful site, lies nestled in a glaciated valley, surrounded by snow-capped peaks and a pristine forest. 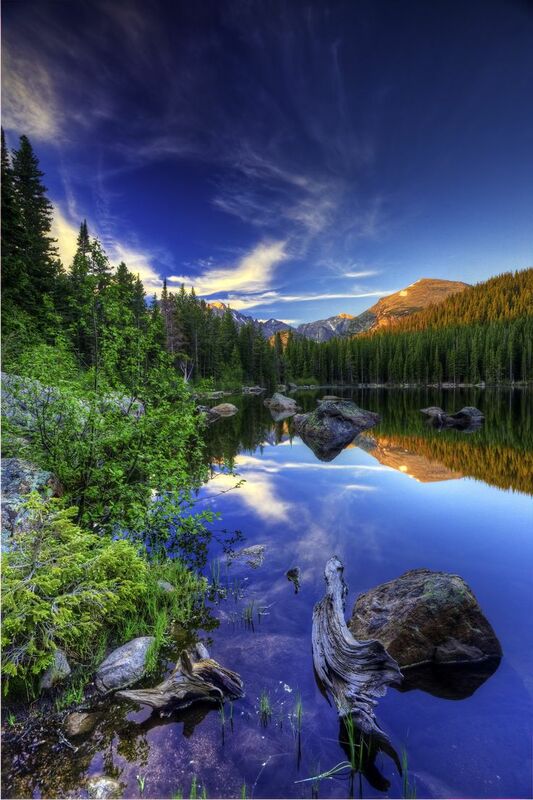 This circular trail offers a Longs Peak from Bear Lake - Rocky Mountain National Park, Colorado scenic view of inviting clear water, surrounded with deep green fir trees and the Rockies as a backdrop. It's a relatively level hiking path and most visitors can walk the entire trail. Because of the spectacular views and easy access, this parking facility becomes overcrowded during peak season. The towns of Silverton and Durango, Colorado. 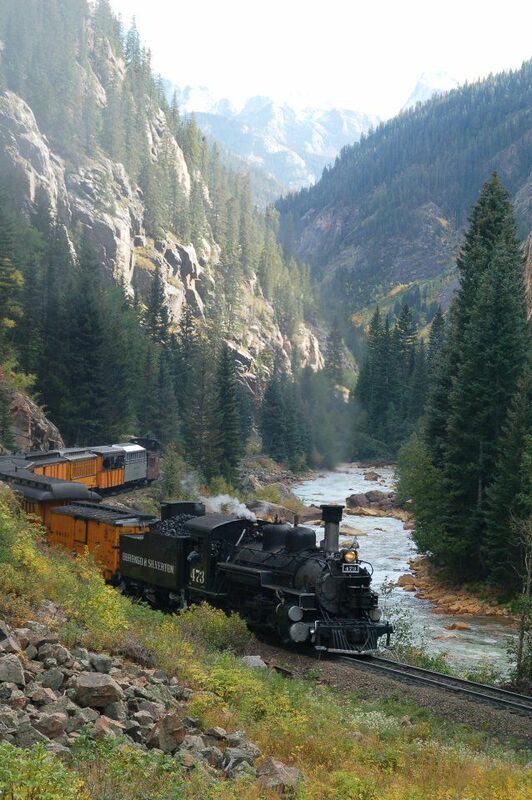 This is the Silverton and Durango Narrow Gauge Railroad where you can take an all day train ride through the San Juan National forest from Durango to Silverton on an old steam train from the 1800's. The ride is 50 miles one way but well worth it for the magnificent views. 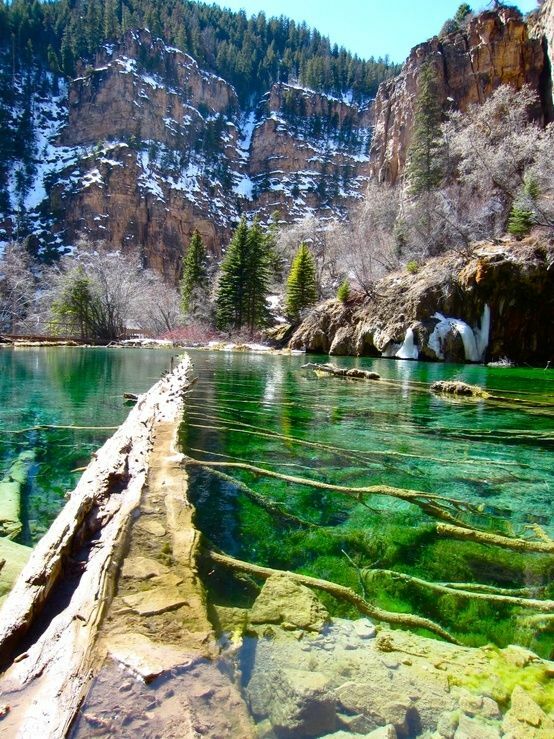 Hanging Lake, Colorado, U.S.A. Near Glenwood Springs, Colorado is a beautiful mini-lake boasting waterfalls, all sparkling an extra turquoise color because of the mineral travertine that is in the water. It’s also one of the only places where the yellow Columbine flower grows. Whether you’re a sport enthusiast or a culture buff, Denver, Colorado offers something for everyone, all set against the backdrop of the snow-capped Rocky Mountains. 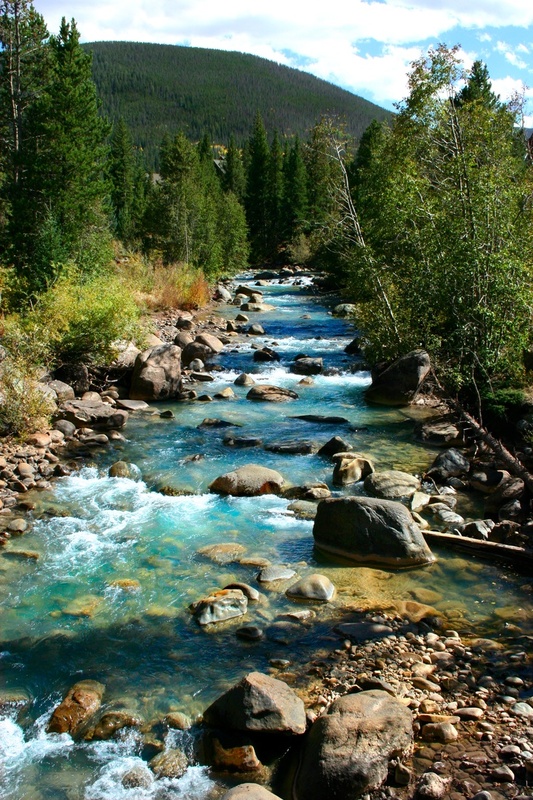 Lies in the South Platte River Valley, close to the dramatic range of the Rocky Mountains. 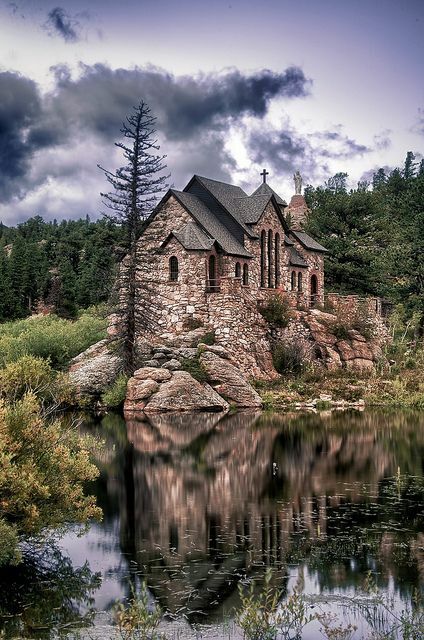 It was founded in 1858 as part of the Pikes Peak Gold Rush. Today, the city remains vibrant, with an emphasis on outdoor life and sport, but you’ll also discover many cultural attractions at the heart of this capital. 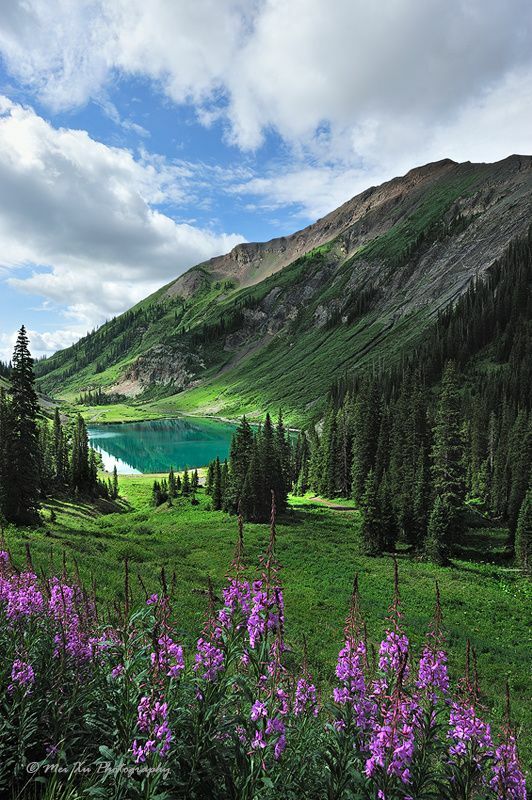 Crested Butte, Colorado, designated the "Wildflower Capital of Colorado" since 1990, plays host to the Crested Butte Wildflower Festival every summer. While flowers are in bloom from early June through the end of August, the peak of the season, with the greatest number of flower varieties in bloom at once, typically takes place in mid-July, coinciding with the week-long festival. 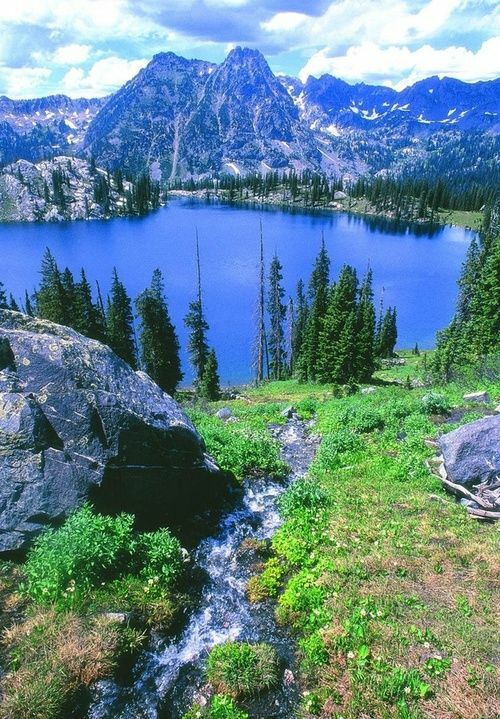 Blue Lake is a lake located just 26 miles from Steamboat Springs, in Jackson County, in the state of Colorado, United States, near Fort Boettcher, CO. Fishermen will find a variety of fish including rainbow trout, brown trout and perch here. Whether you’re baitcasting, spinning or fly fishing your chances of getting a bite here are good. So grab your favorite fly fishing rod and reel, and head out to Blue Lake. Surrounded by over 3 million acres of national forest and wilderness areas, you’ll find yourself in the center of nature’s playground in Pagosa Springs. With the San Juan Mountains and a variety of outdoor activities at your doorstep, along with hot springs, charming shops, historic sites, and an assortment of artisans, you'll find plenty to do in Pagosa. 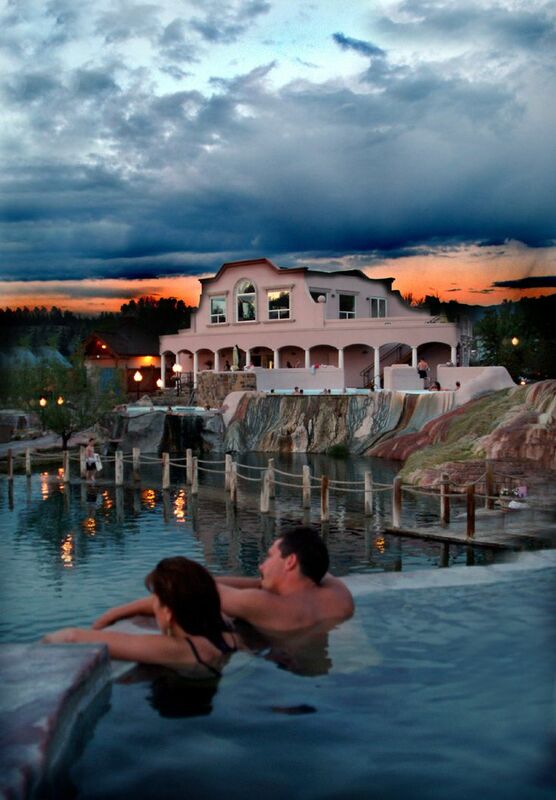 Enjoy the charming setting of The Healing Waters Resort & Spa, reminiscent of a simpler time. For Lodging, the Healing Waters offers a range of reasonably priced accommodations to fit almost any budget. Rifle Falls State Park is the closest you'll get to the tropics in Colorado. The falls is a lush area of trees and greenery kept moist by the spray of the cascading triple waterfall. The park's lush vegetation and waterfalls have attracted photographers and movie crews from around the country who take advantage of the area's unique scenery. Mysterious limestone caves beneath the falls entice spelunkers and other curious visitors to explore their dark depths. Simply breathtaking. 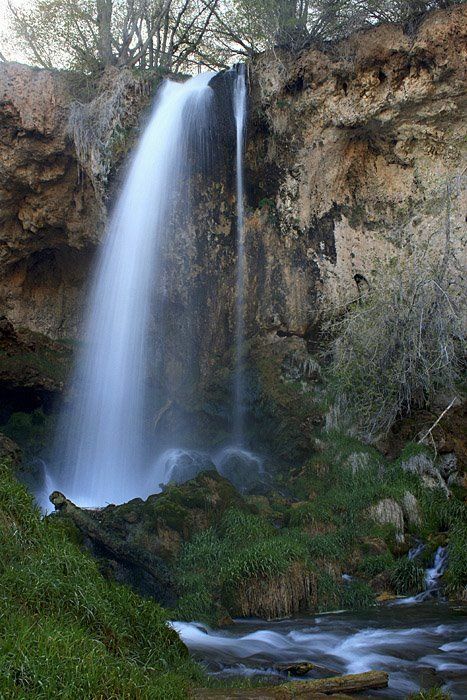 Rifle Falls has 12 drive-in and seven walk-in campsites. 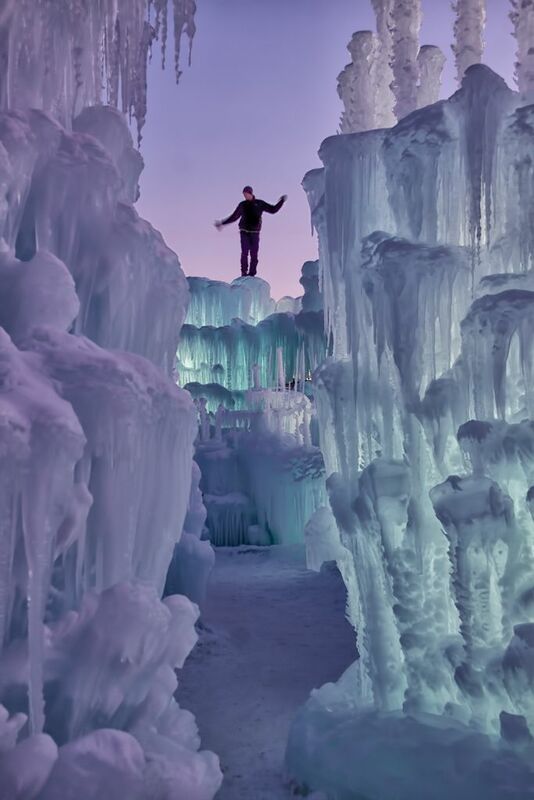 Silverthorne Ice Castle - a massive ice fortress complete with soaring towers. The glittering structure is embedded with lights, creating a heavenly glow for visitors to enjoy at night. The Broadmoor Seven Falls in Colorado Springs is a series of seven cascading waterfalls, reaching a total height of 181 feet. 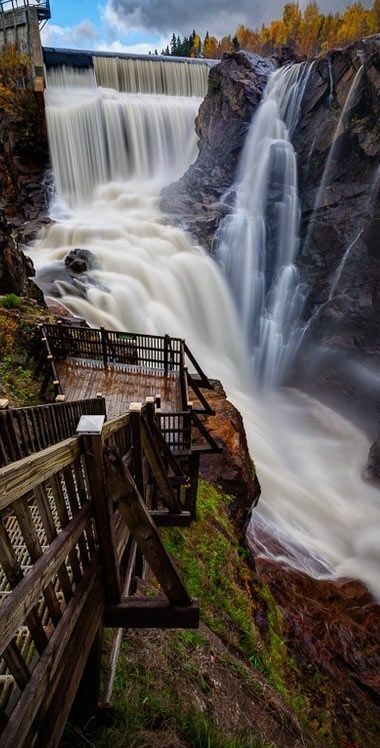 Visitors can experience it up close and personal via 224 steps on the staircase from the base of the falls to the peak. Seven Falls in Colorado Springs is the only waterfall in Colorado to make National Geographic's list of international waterfalls. 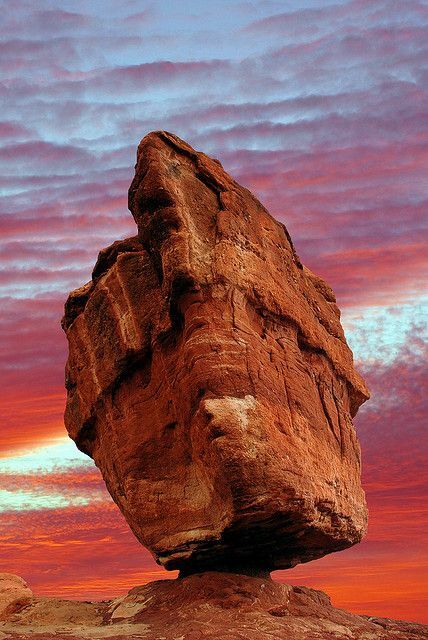 Balanced Rock in Garde of the Gods is a fountain formation, a combination of coarse sand, gravel, silica and hematite. It is hematite that gives the large balancing rock rock its red hue. It toppled off of a ledge, first resting on sand that was gradually worn away at the base. Balanced Rock presents a popular photo opportunity. Picturesque sunsets burn the skies over the La Sal Mountains, giving way to the brilliant sunlight and blue skies of the new day, and the wonders of Colorado's canyon country beckon to be explored with your stay at Gateway Canyons Resort, a Noble House Resort. Nestled in scenic Unaweep Canyon, this fabulous resort immerses you in the true beauty of the Colorado countryside along with complete luxury and comfort. Enjoy spacious rooms and the warm, casual elegance of Kiva and Kayenta Lodges, crafted in an inviting Southwestern style and complete with large picture windows, fireplaces, and balconies. Or choose one of the private casitas, your own home away from home, with separate living rooms, a den, enticing outdoor showers, and your own private deck. At Gateway Canyons Resort mountain living has never been so luxurious. There is plenty of sandy desert in Arizona and California, but nothing quite like the Great Sand Dunes of Colorado. 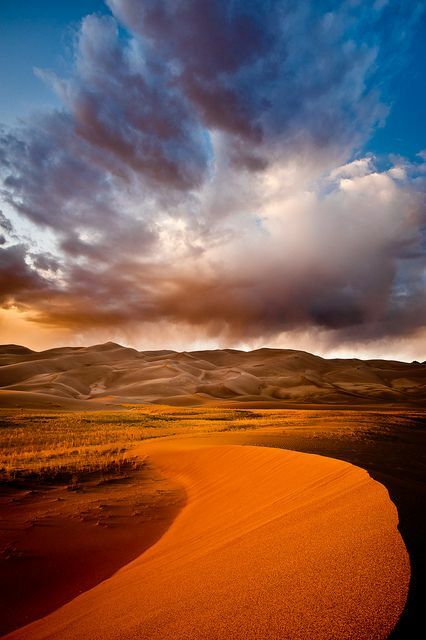 Seeming totally out of place at the edge of the snow-covered Rocky Mountains, these dunes of pure golden sand cover an area about 7 by 5 miles and reach heights of 700 feet above the floor of the flat San Luis Valley, making them the tallest dunes in the USA. 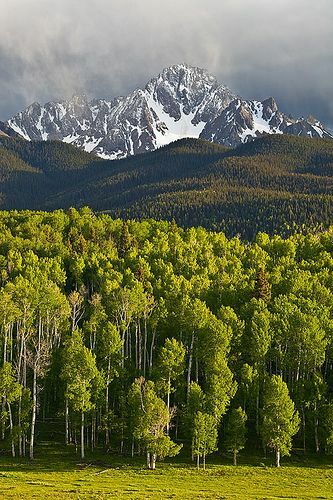 The Maroon Bells, surrounded by pristine National Forest lands, are the most photographed peaks in all of North America. Here you can explore the glacial valley while surrounded huge mountain peaks. 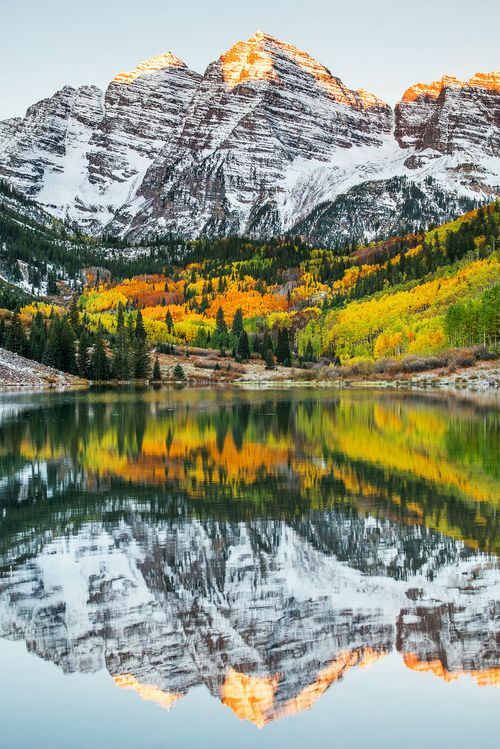 Maroon Lake is surrounded by fields of wildflowers, mirrors images of the Maroon Bells in it's waters.